People Savvy HCM - Payroll | Bennett/Porter & Associates, Inc.
People Savvy HCM allows you to establish the frequency and process payroll on your own schedule. Configurable checklists walk you through every step of the process; so nothing gets missed. Need a special, one-off check because of termination, a commission, or paying out a bonus? No problem. You’re in control! Make individual changes easily, or update entire groups using the mass edit feature. 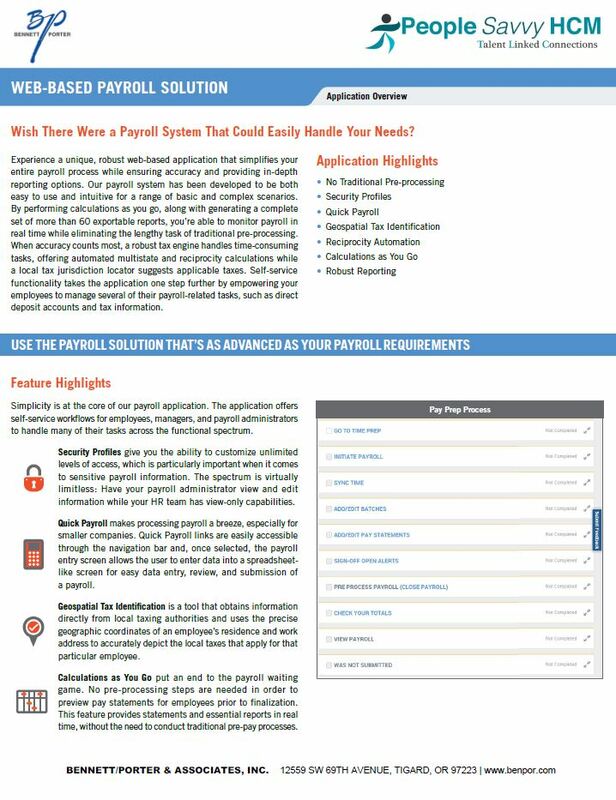 Payroll is continually updated in real-time, helping reduce compliance risk and providing accurate, timely pay to employees. Employees can securely access on-demand payroll information such as pay stubs, earning histories, and W-2 forms through a mobile app or web browser. Either way, tools allow employees to make changes to direct deposit information and update W-4 deduction forms themselves which updates the payroll record automatically or upon approval. Payroll data is readily available through flexible, ad-hoc reporting. Built-in tools make it simple to sort, group, filter, or customize essential reports. 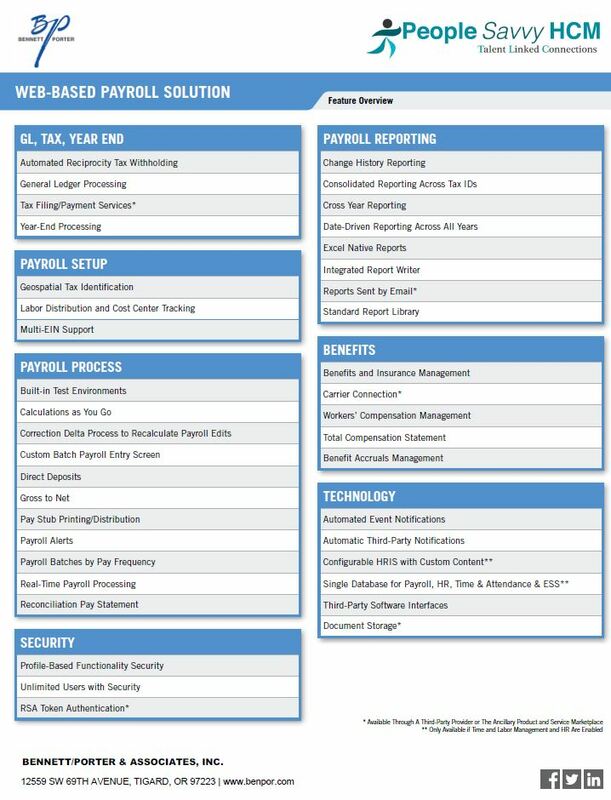 Over 60 pre-created report templates are able to be modified, including Payroll Register, General Ledger, and Payroll Recap & Funding. Export your reported data into multiple file formats for presentation or import elsewhere. Or make distribution easy by configuring auto-run and having those reports emailed automatically to recipients before they even open their inboxes. People Savvy HCM automatically maintains tax tables with the latest information in its cloud-based system; so tax table and software updates don’t waste your time. Geospatial Tax Identification correctly assesses taxes based on employees’ home and work addresses. The local tax jurisdiction locator also suggests applicable taxes.